Cacharel Scarlett happened upon my cluttered desk a while ago, it was a little sample knocking around from some of the circles I used to frequent back when perfumes were I hobby where I had time to indulge. I really miss it–the perfumes, I mean. So I gave Scarlett and a few others a whiff to see how things stacked up. And to dust off that long neglected notebook. In Bottle: A light floral, a little pungent upon first whiff but I fear I may have smelled it a little “too hard”. Nothing really fancy about it yet. Applied: Bright and floral, a little juicy upon first application. There’s a sharp citrus to this at first that smells into a more rounded white florals style of scent. It’s very classically flowery and pleasant enough to wear. Scarlett isn’t really light, and nothing in it really reminds me of Scarlet O’Hara. But then, my vision of her doesn’t paint her in a dainty, floral at all and I expected something headier if it was to truly represent her. After a while of the white florals, the scent mellows into a mild warmed amber, honey and floral scent. Extra: Scarlett was dedicated to the famous Scarletts in past and present including O’Hara and Johansson. Design: I was actually surprised to see the bottle when I looked it up. It’s definitely not your typical curvy flacon and I actually kind of like it, though it clashes with my usual tastes. It’s different, and I guess that’s plenty to lend it credit to me. Notes: Lemon, pear, jasmine, orange blossom, honeysuckle, amber, sandalwood, honey, white musk. So I mentioned this didn’t really remind me of Scarlet O’Hara, it’s close and I understand where they’re trying to take it. To me, O’Hara is a heady, dark floral with a distinctive tuberose and a flash of something sharper and tangier like a cedar. I don’t know much about Johansson. In the end Scarlett is a nice, grown-up scent. It’s not groundbreaking enough to really set it apart from many of the other florals I’ve experienced, unfortunately. 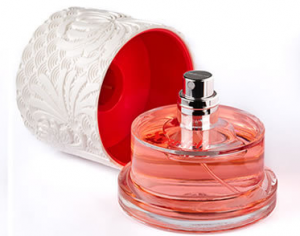 Reviewed in This Post: Scarlett, 2015, Eau de Toilette. This entry was posted in All, cacharel, Fashion Houses, floral, Reviews By House, Reviews By Type and tagged amber, honey, honeysuckle, jasmine, lemon, orange blossom, pear, sandalwood, white musk. Bookmark the permalink.